How well dressed will you be this summer? I’m sure I’ll be about as fashionable as I’ve ever been, but I’ve decided this is the summer I will weed out all those knee shorts, pedal pushers, and slacks that either don’t fit comfortably or just don’t feel appropriate for a woman of my age. In the meantime, we’re stuck here in Utah somewhere between winter and spring and my spring/summer seasonal clothes I’ll continue to wear are still waiting. There are several new blouses purchased at terrific sales prices already waiting in the closet. Now I only need to find the right length slacks/shorts for the hotter weather that’s sure to come eventually; I’m keeping my eyes peeled. So naturally, when I opened the living section of the paper today, one of the first things to catch my eye were the pictures of summer styles. There was a snappily arranged waist to ankle photo shoot of four new summer pants styles for the younger set, two for girls and for boys. Nothing terribly unorthodox. This is Utah, after all. But then I looked closer, and boy was I shocked! Not because they were in poor taste, but because of the prices! I may even learn to sew all over again this year! For girls, there’s a pair of pastel-colored short-shorts by Seven For All Mankind, with the waist at hip level and tiny inseam (yes, there IS an inseam that distinguishes them from a short skirt but it’s really very short) available at Lolobella and JMR at Fashion Place Mall are only $134! Or you can order a pair online here for the same money. (Go ahead and take a look! You know you’re curious!) 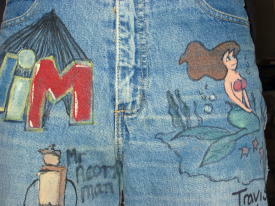 The other pair featured in the paper was by Paige “Sweetzner,” and is made of premium denim. It can be yours for $119 at the same store mentioned, or you can also order it online from a variety of sources. If you don’t have rich parents or hard working parents willing to cough up that kind of dough, and must buy them yourself, let’s see how that might work. Let’s say you’re working for minimum wage at a fast-food place. That means you’ll have to work nearly 20 hours to pay for one, plus nearly 23 hours for the other pair. But hey, you’re gonna be the envy of every female out there who knows fashion! The bad side of this is that after more than 40 hours, or a typical work week, you’ll still have only two pants styles to wear this summer. If these prices are any indication, you’ll have to work another 30 to 40 hours for tops to go with them. I won’t even bother to go into pointing out the discrepancies in cost for men’s clothing versus women’s, other than pointing out that two shorts were shown for men/boys, both pair less than $50! Men always make out better in fashion than women, even in the difference in cost to have clothes professionally cleaned. I mean when you pay prices like this for clothing, you don’t wash them yourself, do you? I have one last suggestion I can offer. If you can afford prices like this, you can order those in the picture on the left from me. I’ll even hand wash and carefully sanitize them for you. As you can see, they are vintage VIM (as in vim & vigor). And lest you assume they aren’t in style anymore, take a minute and compare them to these Lola Splatter short shorts priced at $150. I’ll only charge you $98.99 and I’ll throw in free shipping. But you’d better hurry! There’s just one pair left! This entry was posted in Families, musing, Musings, Personal and tagged cleaning, fashion, short shorts by Alice. Bookmark the permalink. I was never a dedicated follower of fashion, I prefer to find my own style and stick with it. Don’t think I mentioned that I like the new look! I’m not a fashion follower either. I go for cost, comfort … and old fashioned me … modesty. When I worked I spent more money on clothes but now that I am retired there are so many more things I want to do with my money than buy clothes. don’t even get me started! perhaps we should consider a clothing business. i’ve surely got a bunch of old stuff around. and just yesterday i walked by a fancy store (with an italian name to add to it’s charm and price tags) and saw jeans with carefully place paint splatters for sale. i bet we’ve both got some of them, huh?